While I like to write about how to travel for free sometimes things you want to do cost money any there is no way around it. Yosemite is amazing but it is an expensive vacation if you stay in the national park. Start your research at http://www.nps.gov/yose/index.htm I booked this vacation in January of 2012. There was still snow on the ground I thought I was way ahead of the game but not for reservations for Yosemite. They open the reservations a year in advance and they will fill up. So book early!! http://www.yosemitepark.com/lodging.aspx By the time I booked all the rooms were full in the valley. There were campsites but I could not convince Mr. Travelmista to stay in a tent. So we ended up booking a room (with a communal bath) at the Wawona Hotel. Still in Yosemite but about 45min south of the valley. I must admit I was not fully aware of the travel distance away from the valley. For a hotel with no bathroom it was not cheep. They do have a great cancelation policy but I also think this is why the valley hotel fill up so early because people cancel. The Delaware North company runs the hotels in Yosemite and I must say they have also created a little monopoly on hotels and food. The cost of both are somewhat outrageous especially for a family vacation. Now I know it is just the two of us but now understand why families bring in food because the cost can be so high. I am sure we could have watched the openings and changed room to one in the valley if we were more proactive but again I must admit I was looking forward the charm of the Wawona Hotel. 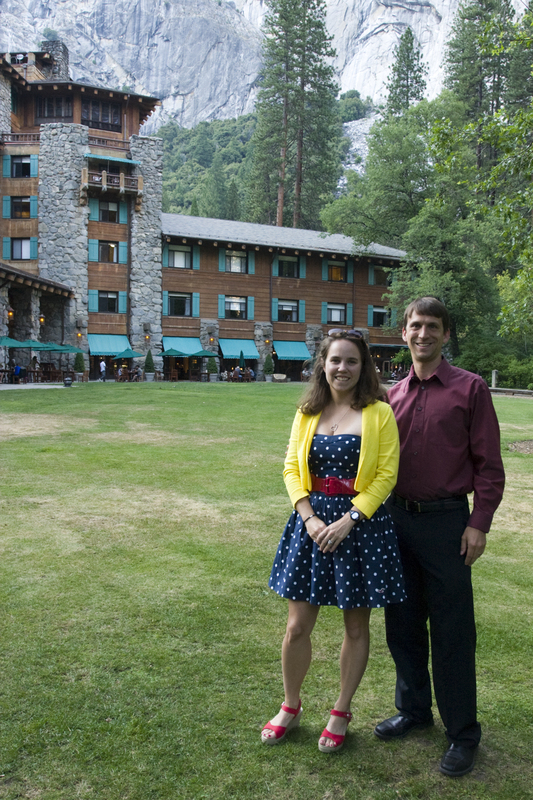 I will talk more about the Wawona hotel in the third trip report in this series. Mrs Travelista at the Ahwahnee Hotel in the Valley. We only had dinner here it was way too expensive. The highlights of our trip were Mariposa Grove and the Mist Trail. One of the benefits of stay at the Wawona hotel was how close you were to the Mariposa Grove to arrive early to hike to fallen tree. Mariposa Grove is the home of 500 giant sequoias that are over 3000 years old. While we were really impressed with all the Giant Sequoias, including all of the special trees like the telescoping tree. Each one has a little magic to it and was really cool to experience each one. By arriving early we hiked almost by ourselves to the top. You can take a tram to the top but it starts late (like 9am) and we arrived early to avoid the crowd not to be a part of the crowds. We are pretty fit so this hike was not an issue for us. We were done with the hike by 11am and saw the crowds of people just starting the hike as we descended down. This was one of the highlights of our trip. Mrs Travelista showing the scale of the giant Sequoia Trees. Mrs Travelista and Mr. Travelmista under the California Tree. My favorite special tree the Telescoping Tree. You could look up in the center and see the sky. It was amazing that it is still standing. My other favorite thing to do was hike the Mist Trail to Vernal Falls. Now I was up for the "Easy" hikes and even "moderate" but I thought strenuous was out of the question but I really wanted to see the mist trail so we went for it and took it slow. The hike starts at Happy Isles trail head. The The incline was hard and we stopped a lot on the middle portion but by the time we made it to the bridge you could see Vernal falls. It was amazing to see such a powerful waterfall. The Mist Trail was the trail next to Vernal Falls and is called such because of all the Mist coming off of the waterfall. It is a good way to cool off with the gentle mist sprays from Vernal Falls. We continued up to the top and even half way to Nevada falls but turned around because we wanted to go rafting down the Merced river in the valley. This was amazing and I want to do it again. Mr Travelmista wants to hike half-dome next year. It is a goal of his and I am sure he can do it but I might need to train for it. The real challenge will be to get the permits. We tried this year but I am glad we didn't get them because I don't think I was really ready for it. Mr Travelmista striking a pose in the Mist at Vernal Falls. The strenuous hike up to the top of Vernal Falls. Other hikes we did were Bridalvail Falls which is 617ft waterfall owes its name to a legend from the Ahawahneechee Native American Tribe. They believed that inhaling the mist of the waterfall would improve one's chances of getting married. It is kind of like the modern tradition of catching the bouquet or garter. Mrs. Travelista at Bridalvail Falls. Yosemite Falls is the highest waterfall in North America and the sixth largest in the world at 2,424ft above the valley floor. This is a really easy hike to see the falls but if you want to get closer we did see lots of people scrambling the rocks towards the falls. As I mention early we also took a raft down Merced River. We saw lots of campgrounds on our way down the river but the water was very very cold and we had no interest in swimming. The Merced River helped carve out the Yosemite Valley. The river is 145 miles long and the Yosemite Valley is 8 miles long and about a mile deep. Other popular stops include Glacier Point which is a great place to view sunsets in the Valley. It has an elevation of 7,214ft above the valley. It also has awesome views of Half Dome , Yosemite Falls, Vernal Falls and Nevada Falls. The Tunnel view offers breathtaking views of several attractions including El Capitan, Half Dome, Bridal Falls. It is an easy stop along the road with great views. Finally Half Dome is the cream of the crop at Yosemite. As I mentioned early Mr Travelmista wants to hike Half Dome. It is a granite dome is the most popular rock formation and rises more that 4,737ft above the valley floor. You need hiking permits to hike the final incline to the top using the cables which are only up during the summer months. Tunnel View with El Capitan on the left and Half Dome on the right. Next time we will stay in the Valley and be more prepared for strenuous hikes that really challenge us.